Ocala, Florida — While patrolling the area of Forest Road 8 and Old Forest Road 573, FWC Officer, Washburn Wear, heard gunshots in the distance. As Officer Wear headed in the direction of the gunshots, he saw a vehicle with one headlight driving slowly toward him. When the driver spotted the FWC officer, the vehicle turned east on Old Forest Road 573. Officer Wear followed and initiated a traffic stop. When the officer approached the vehicle, he saw a 12-gauge pump shotgun in plain sight lying on the rear floorboard of the vehicle. The occupants, identified as Justin Matthew Reynolds, 18, of Umatilla, and Michael Ray Harrison, 33, of Groveland, were then asked to exit the vehicle so the officer could secure the firearm. The officer advised Reynolds, the driver, he had a headlight out and asked where he was coming from. Reynolds paused from a moment, and then stated that the two had just shot at a deer on the side of the road. 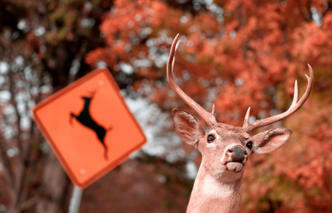 Both men admitted to shooting at a whitetail buck from a moving vehicle while using a spotlight. They also stated that they had thrown the spent shotgun shells out the window of the vehicle after firing the shots. FWC K-9 Officers Joe Simpson and Mike Rice responded to the scene. They utilized K-9 Moose to locate the spent shells. Harrison was cited for Discharging a Firearm from a Roadway, and Reynolds was issued a warning for the headlight; both received citations for Attempting to take a Whitetail Deer at Night by Firearm and Light. The citations are for mandatory court appearances.